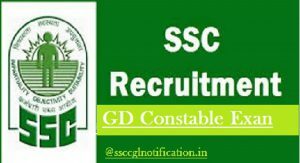 SSC Constable Recruitment 2019-20 Notifications:- Everyone have dreams to get high profile Central Government Jobs after 10th pass. Looking for Latest GD Constable Recruitment notification by ssc in capf (BSF, CRPF, CISF, ITBP, SSF, SSB, NIA and riflemen) then, there is good news for all the candidates. As, staff selection commission going to conduct Recruitment for Constables (GD) in CAPFs Exam-2019 Non –Mandated Examination for Group ‘C’ Non-Gazetted, Non-Ministerial posts in Central Government Departments / Police department / Offices and in several States overall in India with having bumper 54953 Vacancies. Interested candidates can do Modification in Application form from the official website. If you are looking for ssc govt jobs after 10th Pass Qualification any where in India then, this page is for You. Here we provide latest GD constable exam Updates & notification detail. To makes your dream come true, Government of India, Various Ministry & govt department, Directorate General, Staff selection Commission (SSC) department that is also known for hiring meritorious, young and motivated candidates to pursue Career in there frontier areas in sector for Constable Posts 54000 vacancies to recruited in payscale (Per Month) Rs. 21700 – Rs. 69100/-.. As, official notification out. so, , you can check below eligibility, Syllabus, Books & Important details. If you posses minimum eligibility criteria (i.e Qualification, Nationality, age limit, Syllabus, Tier-1 Exam detail & other essential requirement) then, you can directly get do online registration from official portal website of SSC i.e http:/ssconline.nic.in or ssc.nic.in. Below you will get ssc Constable CAPF exam 2019-2020 current running Posts Vacancy Notifications detail. As GD Constable exam for the candidates who are possessing Matriculation (10TH) Qualification in any stream from recognized board. Additional qualification for the same mentioned below. SSC had made changes in the minimum and maximum age limit from the past years. SSC has notified that upper age limit will be 23 years and minimum age limit is 18 years. A person of Indian origin migrated from Pakistan, Burma, Sri Lanka, East African countries of Kenya, the United Republic of Tanzania (formerly Tanganyika and Zanzibar), Uganda, Zambia, Malawi, Zaire, Ethiopia, and Vietnam with the intention of permanently settling in India. Application are invited in the prescribed format from eligible persons, who are Indian nationals, for recruitment given Posts for Various region wise vacancies by various employers indicated in the advertisement i.e Last date. Eligible candidates can do online registration & Download official notification from the link below and then, applicant can fill the downloaded application form for future Use. According to the latest SSC Constable notification there are SSC CGL calendar which contains date for your different exam Tiers. You must check it carefully. All the information given above is as per the staff selection commission CAPF Constable latest notification. We advise you to book mark this page as we will provide you further information as soon as latest notification for SSC Constable 2019 Exam will arrive.